Northwest National Real Estate: Sale Pending! National Forest Nearby! Sale Pending! National Forest Nearby! Large 1994 modular home for sale in a picturesque timbered setting just 4 miles outside of Grangeville, Idaho. Private and secluded, ranch style house, can be sold separately with 7 acres, or combined with neighboring custom home on an additional 9.2 acre timbered parcel. Both are heavily timbered yet some open area included for a pasture or gardening. Property has an excellent well, with an additional 2nd well water source. This real estate has fruit trees and more, making it a must see! 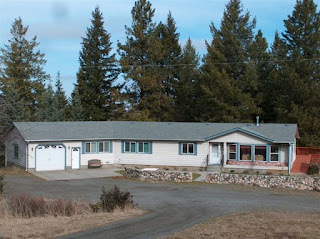 Located not far from the many recreational activities of the Nez Perce National Forest. Priced at $189,900. Contact Jim Moody at All Around Realty at 208-983-7878 for more information.